Description Moonroof, Heated Leather Seats, Cross-Traffic Alert, Smart Device Integration, Blind Spot Monitor, Aluminum Wheels, Back-Up Camera, [X01] SR PREMIUM PACKAGE, [R10] REAR SPOILER, Remote Engine Start, Bluetooth, Satellite Radio, iPod/MP3 Input. 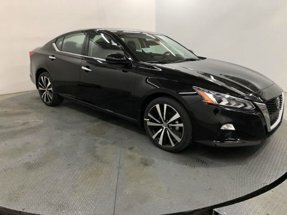 2.5 SR trim, DEEP BLUE PEARL exterior and Sport interior. EPA 37 MPG Hwy/27 MPG City! Warranty 5 yrs/60k Miles - Drivetrain Warranty; READ MORE! Leather Seats, Back-Up Camera, Satellite Radio, iPod/MP3 Input, Bluetooth, Remote Engine Start, Cross-Traffic Alert, Smart Device Integration, Blind Spot Monitor, Heated Leather Seats MP3 Player, Aluminum Wheels, Remote Trunk Release, Keyless Entry, Child Safety Locks. SR PREMIUM PACKAGE Heated Front Seats, Heated Outside Mirrors, LED turn signal indicators, Single Panel Moonroof, REAR SPOILER. Nissan 2.5 SR with DEEP BLUE PEARL exterior and Sport interior features a 4 Cylinder Engine with 182 HP at 6000 RPM*.